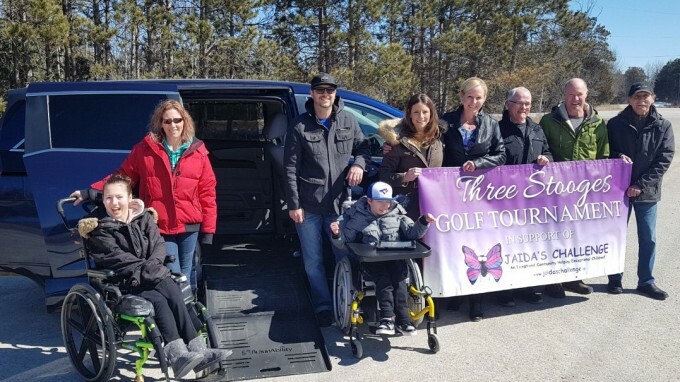 Families Join Jaida’s Challenge and The Three Stooges to Show Off Their Accessible Vans. On a chilly March day Emily Currah along with her mom Paula, and Devon Hansard with his parents Lisa and Clinton, met up with Jaida’s Challenge Co-founder Helen Sykes and local businessmen Roger Martin, Dr. Jim Mackle and Gary Witiuk, affectionately known as the Three Stooges at Silver Brooke Golf Club. It was fabulous to see firsthand the ease with which these awesome kids were able to load and unload from their vans in the comfort of their wheelchairs! The consensus…accessible vans are life changing! !